Janke Book Store has been a fixture of downtown Wausau for generations. Erected in 1874 by Richard J. Collie and purchased by Carl Janke and Reno Kurth in 1919, the retail space at 508 3rd Street was the first incarnation of this Marathon County treasure. Although, back then it was known as Janke-Kurth. “Our grandfather Carl came back from the First World War and in 1919 bought the store with his Army pension money alongside his buddy Reno Kurth,” says Jim Janke. In 1948 the Janke family bought out Kurth’s portion of the store, renaming it Janke Book Store. Today the store is in its third generation of Jankes, with Jim and sister Jane Janke Johnson owning and operating the space on 505 3rd Street, right next door to where their grandfather had his shop almost a hundred years ago. 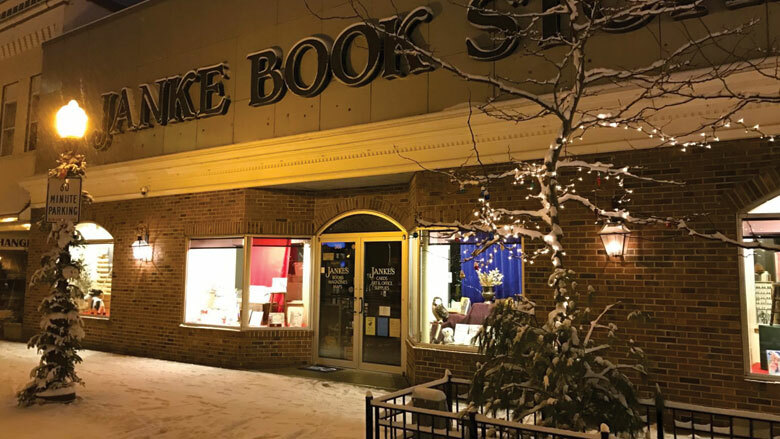 Janke Books has survived a great depression and a few recessions, the death of the streetcar (Wausau’s closed down in 1940), the advent of the Internet, and countless other impediments to thriving retail sales. As a result, owners Jane and Jim have an almost glacial sense of calm when it comes to the future of the family business. Like the Janke “kids,” I grew up in a family-owned business. So I understand some of the combined pressures of history and legacy. Where I considered my family’s business a sort of personal playground—that is, until I had to work there—the Jankes feel the strong pull of obligation to keep the business alive. “I did work in the store until after college,” says Jane, who returned to work the store full time in 1983. Jim, who never left, says that “like most boys, I helped out after school.” (Although Jane refutes this claim: “No he didn’t, he was scared!”). When their father John passed away in 2006, their mother Delores retired and left the store to the siblings. Talking to local bookstore owners is a lot like talking to small newspaper publishers: Invariably, the discussion turns to ways of thriving—or just surviving—in a largely digital marketplace. “There are three things that are troubling,” says Jane, noting how, first, Waldenbooks and the big box stores showed up thirty years ago. Then the rise of digital retailers like Amazon.com, and the ubiquity of tablets and e-readers, put further pressure on the store to court both the walk-in customer as well as book clubs. Foot traffic is key, and Janke’s downtown location helps to bring in customers. “Getting people in the store means more sales, and more sales means we get to keep the doors open,” says Jim. But he notes the decline in book clubs, even though the store has a dedicated space for them near the front. “They don’t really meet in the store anymore,” he says. “The AAUW [American Association of University Women] used to meet in the basement, but the stairs got to be too hard for the older women. I guess they sort of aged out of meeting here,” says Jane, noting how the book club demographic is changing. “But we are still here,” she adds with a chuckle and nod to their almost hundred-year tenure. It’s clear the Jankes are proud to be a part of Wausau past and present. Indeed, their pride is reflected in their large collection of books about Wausau and Central Wisconsin. The store has published a few books of their own, and Jane co-authored two with her father John Janke: Big Bull Falls: Postcard Views of Wausau, Volumes 1 and 2. “Some of these projects do not make money, or we may even lose a little bit. But we think the history of Wausau is important,” says Jane. People make history, and the Janke’s commitment to serving the citizens of Marathon County is just as palpable as their family pride. “We have seen people have kids and those kids grow up as customers,” says Jim, unspooling a story of a man who came into the store five days a week after he retired. “Relationships like these are special,” adds Jane. Clearly a bookstore that has been around for over a hundred years, through two families and more than three generations, has a handle on the importance of books, community, and the history of a place and its people. Dino Corvino has spent a lifetime working for the development of his community, as well as finding ways to give voice to the community at large.